"Till recent years a rather common form of the revelry and thanksgiving which have ever taken place at the ingathering of the harvest was the Kern, though it has now died out everywhere except in a few Northumbrian villages. One of the customs of the festival of Ceres, it had many local variations. It was observed in the northern part of Northumberland at the close of the reaping, not the ingathering. Immediately the sickle was laid down and the last sheaf set on end the men shouted that they had "got the kern". 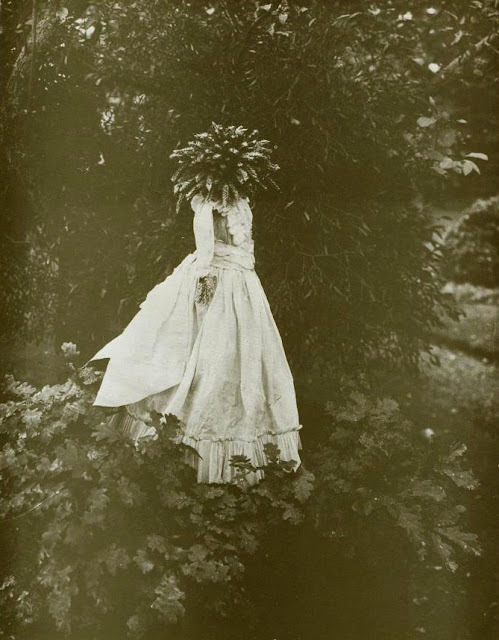 Then a curious image was produced – an image dressed in a white frock with coloured ribbons and crowned with corn ears – stuck on a pole, and held aloft by the strongest man of the party while the rest circled round it. Subsequently it was taken to the barn, set on high, and the merrymakers fell to on the harvest supper." The kern baby – apparently headless, not a baby, and awaiting some spectral groom – a peculiarly gothic version of the traditional harvest corn dollies. where is arthur sultan, the surrey mystic?